Many of us spend a lot of time and money searching for new ideas to decorate our homes and to brighten up our homes. Now that the holiday season is just round the corner, this would be a nice time to look at interesting new options to brighten up your homes and offices giving it a fresh new look. Though many of us would like to give new look and feel to our homes and to our interiors, we will also have our own budget constraints. It is therefore important to come up with interesting wall decoration ideas that do not cost us a lot of money. You can choose interesting photos from your collections and from your digital photos library and transfer those photos to canvas. Normally photos are printed on photo paper either with glossy finish or with matt finish. Now with this new technique you will not be printing the photos on photo papers but they will be printed on canvas sheets that are used by artists for paintings. Modern printers that can print on photos on canvas are available today. But don’t worry you do not have to buy a new printer to transfer your photos to canvas. There are many companies that transfer photos to canvas like ours. You just need to send your photos to such companies and get them printed. It is very important that these photos are mounted on frames so that you can readily hang them on the walls to brighten up your rooms. You can decide on a theme based on which you can choose your photos. This will give your walls very specific niches feel. Rather than choosing some random photos theme based photos on canvas will give your living space special character. For example, if you love animals or pets you can have photos of your pets. If you love nature you can have photos of beautiful sceneries that you have in your collection. In case, you do not have enough thematic photos you can go through the photo gallery of your photos to canvas store. At Getcanvas.co.uk you will find a good selection of photos that you can order without any additional charges. You can choose photos that suit your interiors and your home’s colour scheme. 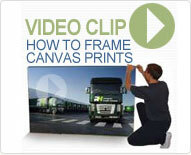 Just make sure that you choose the right sized photos on canvas. Before ordering your photos on canvas to decorate your walls, you need to first decide where you would like to display them. This will help them decide the right size of your photos on canvas. It does not cost you a lot of money to order photos on canvas. They come at very cheap prices and if you buy them at Getcanvas.co.uk, they are very competitively priced. You will be able to save a considerable amount of money. So go ahead and start ordering your photos on canvas to decorate your home this holiday season. Holiday season is after all a time for little indulgence. What is your favourite printer?